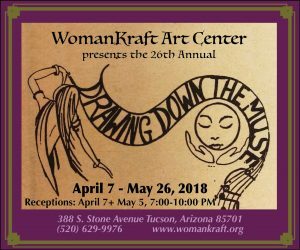 The Arizona Historical Society is visiting WomanKraft this Saturday. 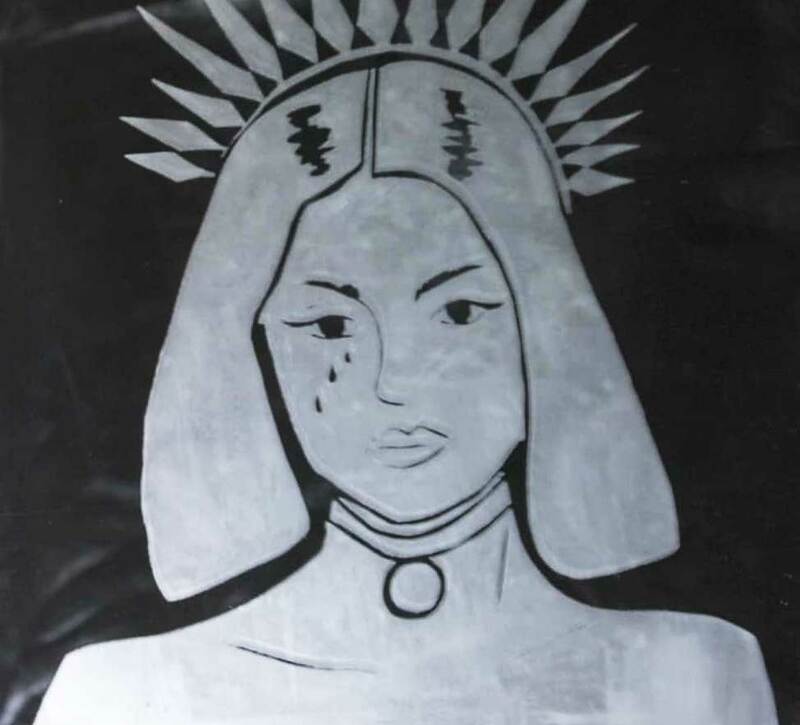 Join us Saturday, June 9th from 1-3 PM for a very special a discussion about how artists can preserve their process and work for an archival donation. Join us in welcoming the Arizona Historical Society as Archivist and Librarian Kate Fitzpatrick and colleague Rachel Black lead a discussion about how artists can preserve their process and work for an archival donation and do a Q&A for specific questions. ARTISTS, this is for you! Get educated on how archives function and the importance of documenting your work for posterity. AHS serves as the steward of state history, fulfilling its mission to collect, preserve, interpret, and disseminate the history of Arizona and the West. Our current exhibit, “Waste Not Want Not” will be on display in the gallery during this event. 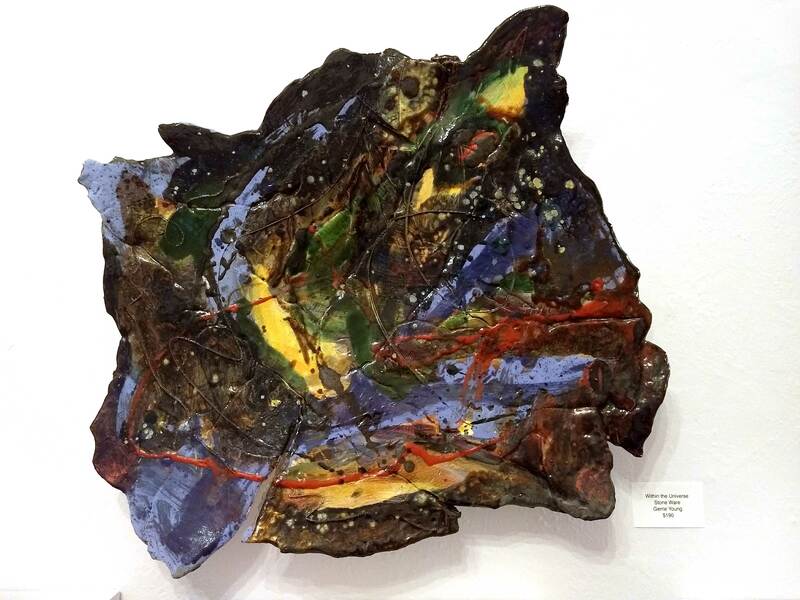 Featuring work by local artists using recycled plastic as their predominant theme and media, this body of work is thought provoking, innovative and good for the planet. See this exhibit every Wednesday through Saturday 1-5 PM. Summer is HERE and it’s BINGO TIME! Join us for a nice, refreshing, air-conditioned evening of fun! With your entry price you get your 1st Bingo card. Additional cards are $1 each! Traditionally some bingo games have one big prize jackpot, but we are looking to spread the win! We will be playing multiple rounds of bingo with multiple winners. 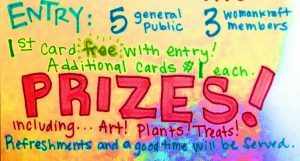 Prizes include plants, art, delicious homemade treats… and more! 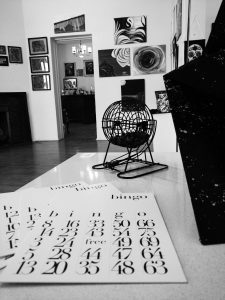 Come try your luck, in a relaxed, fun and art-filled atmosphere. Enjoy an evening where you can help support your favorite non-profit! We can’t guarantee you a win, but we can guarantee you a good time! Refreshments will be served. 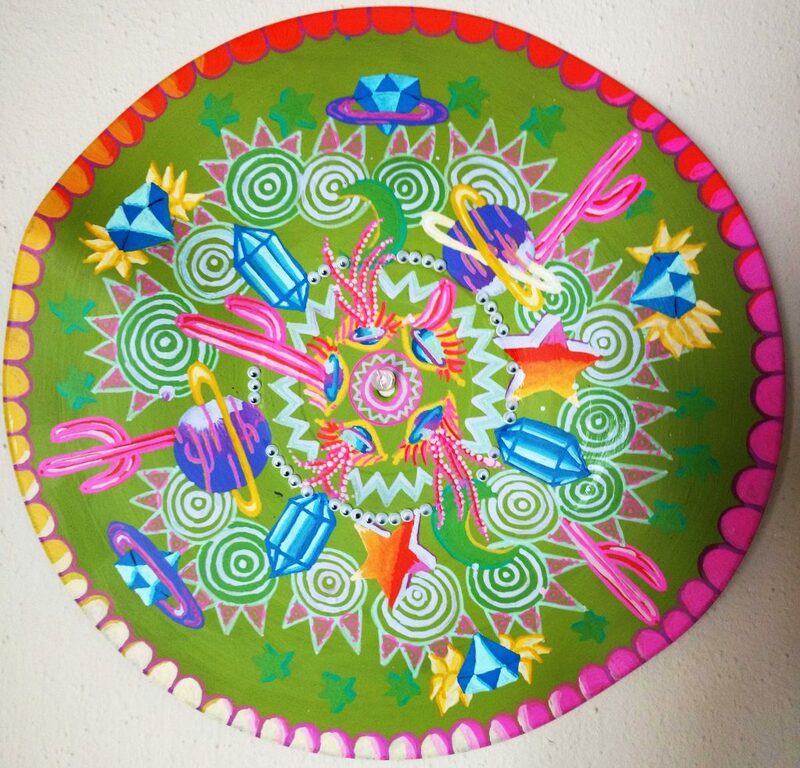 Upcoming exhibition: Let’s be creative by recycling with purpose and create artwork made from predominantly recycled plastics. Water bottles, packaging, car parts, toys, plexi-glass, food containers, or any other “disposable” plastic materials that will be hanging around this planet for a long time coming. 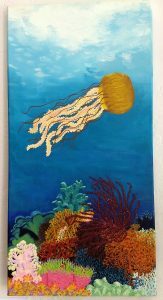 Art can make a difference, let’s try looking at plastic from a new perspective. Deadline for submissions: May 26th. Interested in exhibiting? Call (520) 629-9976 Ext. 3 for appointments with Director of Exhibits Zoe Rhyne. 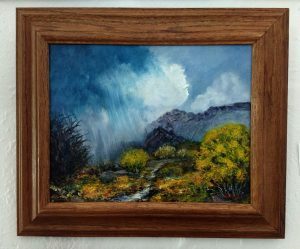 The WomanKraft Art Center, a local non-profit grassroots organization, is hosting an all new exhibit featuring local artists. The Exhibit is entitled WASTE NOT WANT NOT, and encourages artist to get creative by recycling with purpose. 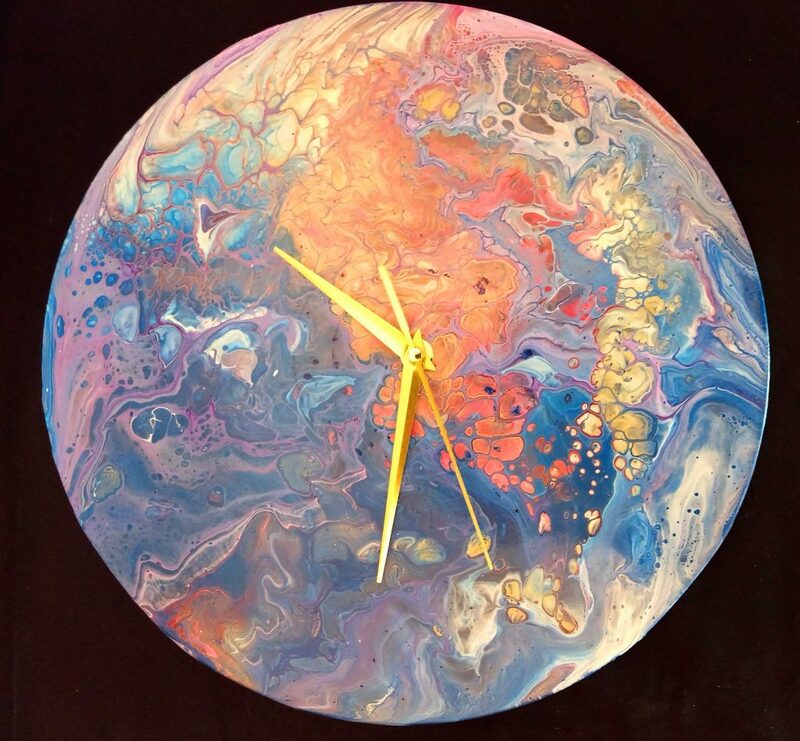 Featuring artwork made from predominantly recycled plastics like water bottles, packaging, toys, plexi-glass, or any other “disposable” plastic materials that are sure to be on the planet for a long time to come. Art can make a difference, let’s try looking at plastic from a new perspective. If you are interested in exhibiting, the deadline for submissions is May 26th. Saturday, June 9th 1-3 PM. Here’s a public opportunity to get educated on how archives function and the importance of documenting artwork for posterity. 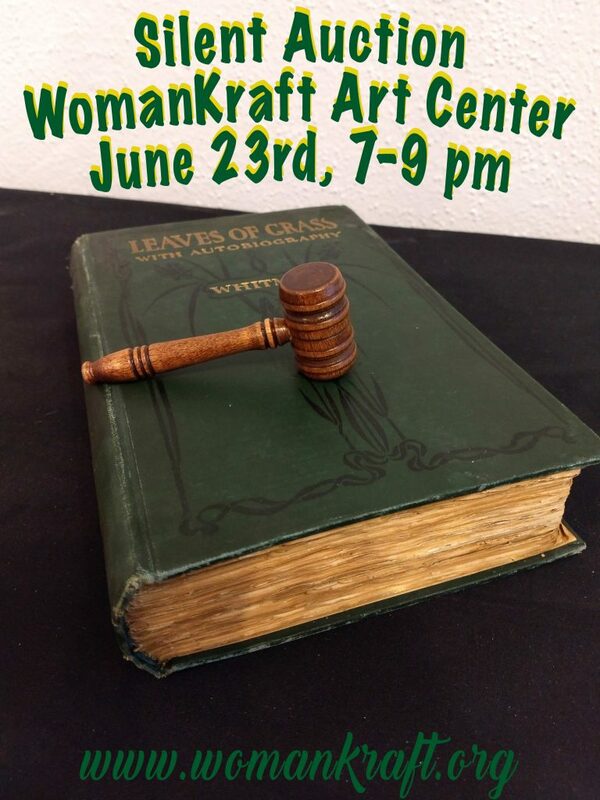 Archivist and librarian Kate Fitzpatrick and colleague Rachel Black will be visiting WomanKraft on Saturday, June 9th from 1-3 pm to share a presentation and and discuss the importance of archives and what AHS does. 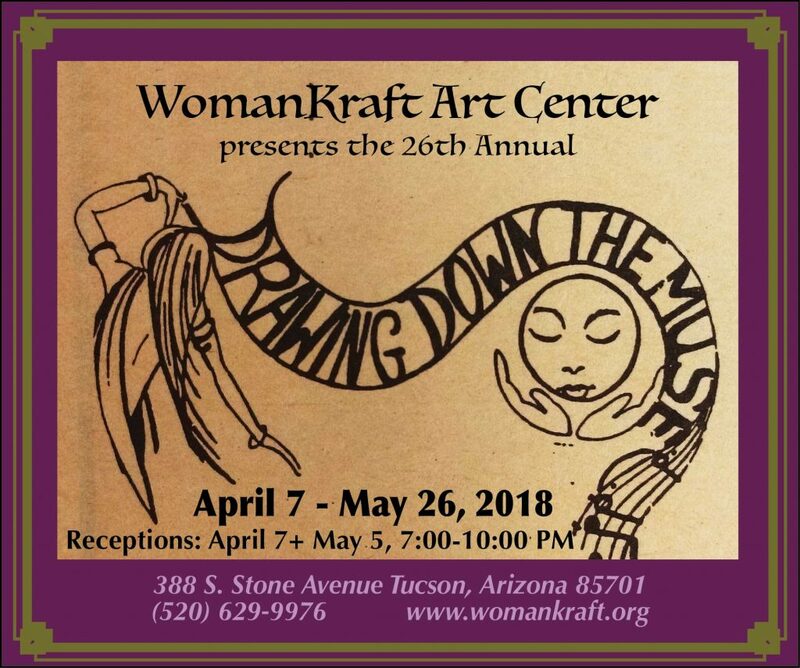 The WomanKraft Art Center is partnering with the Arizona Historical Society for a special event open to the public about archives. Artists, listen up!! Archives can seem impenetrable to those not familiar with them already, and AHS wants to do as much as they can to educate folks on how archives function and the importance of documenting their work for posterity. Archivist and librarian Kate Fitzpatrick and colleague Rachael Black will be visiting WomanKraft on Saturday, June 9th from 1-3 PM to share a presentation and discuss the importance of archives and what AHS does. Suggested Donation: $3 Members, $5 Non-members. 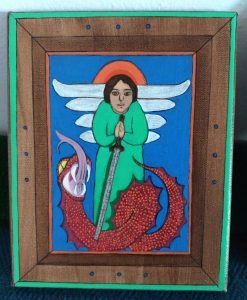 This exhibit features work by over 25 female artists, and this very Saturdaynight after dark, join us in celebrating our divine feminine power! All mediums and subject matter. 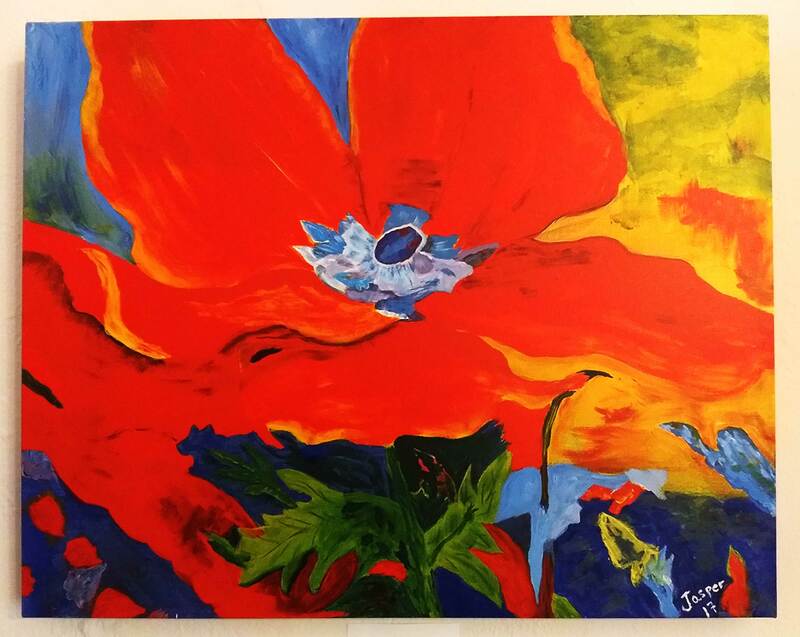 by and for local women artists. Regular gallery hours are every Wednesday – Saturday, from 1 – 5 PM.. The Castle Voice is here! 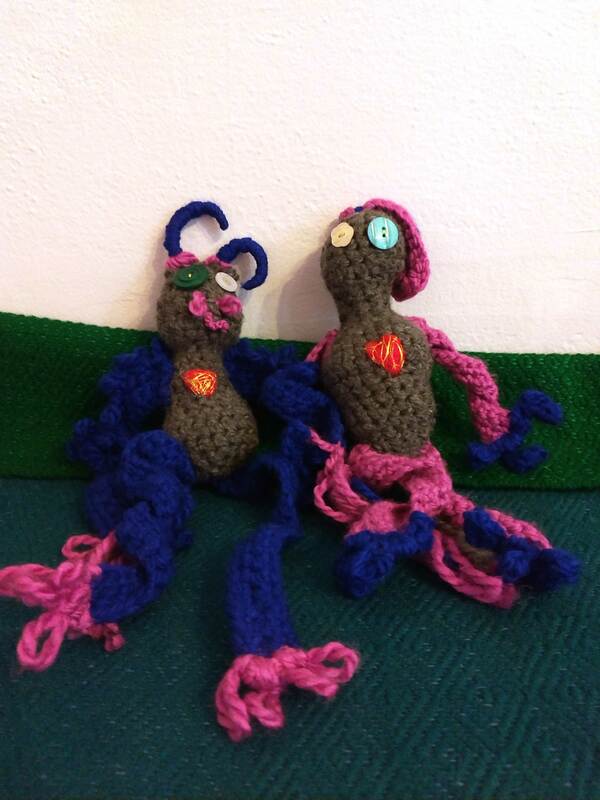 WomanKraft’s quarterly newsletter is hot off the press! 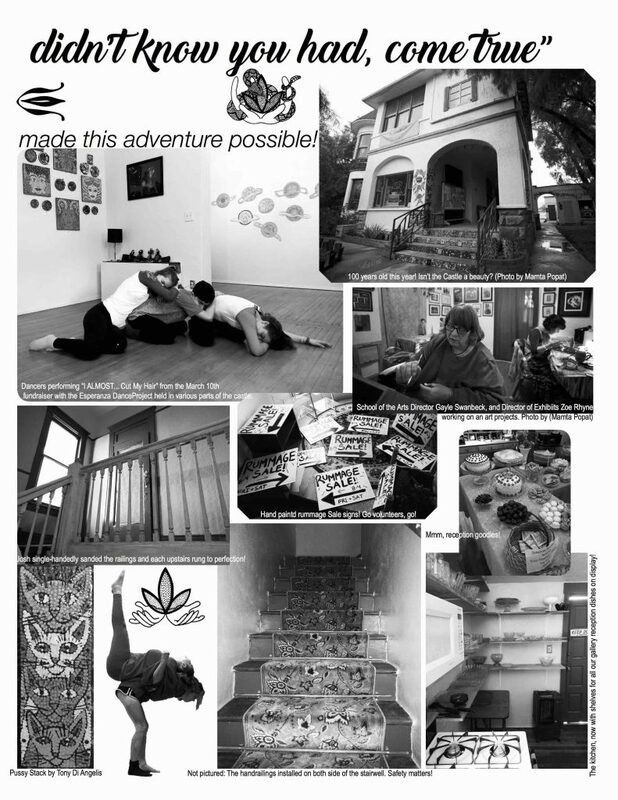 Available through our website, click right here to download your own virtual copy!This newsletter provides information about upcoming events, exhibits, listings of all art classes and workshops offered, community networking opportunities, documentation on recent renovations and updates, and so much more! 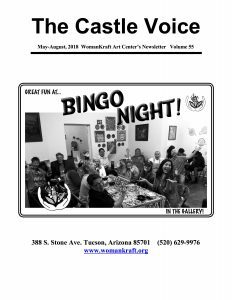 WomanKraft’s latest and greatest fundraiser, emphasis on fun, is Bingo Night! Entry fee is $5 for non-members, $3 for members. And it only get’s better from there! 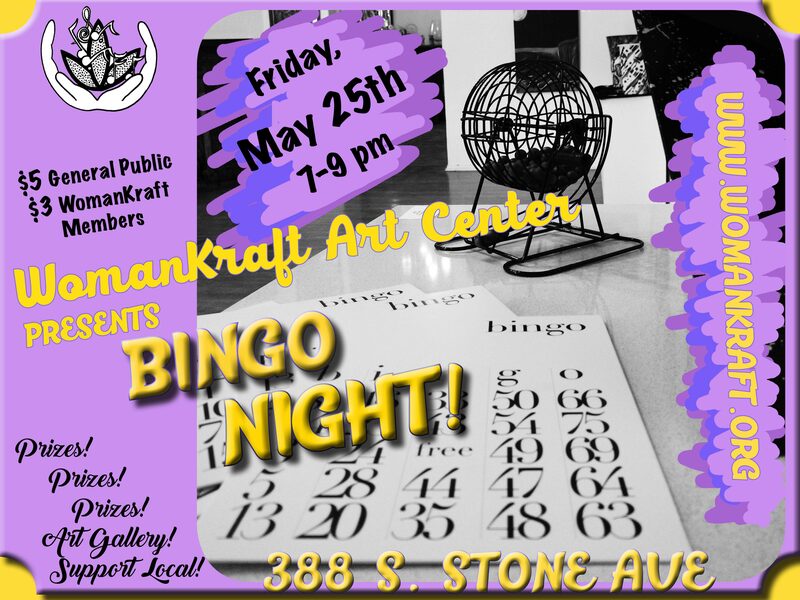 Each additional card is only $1, Bingo is a chance to have fun, support WomanKraft, and walk away with some cool prizes including art, plants, gift certificates, homemade edible goodies, jewelry, candles, magnets… and more!. And who knows, you might even see something on the walls that you just can’t live without! Hosted in the gallery, where “Drawing Down the Muse” is currently on display. Entry is $5 General public, $3 WomanKraft members. With your entry price you get your 1st Bingo card. Additional cards are $1 each! Regular Gallery Hours: Every Wednesday through Saturday, 1:00 – 5:00 PM. 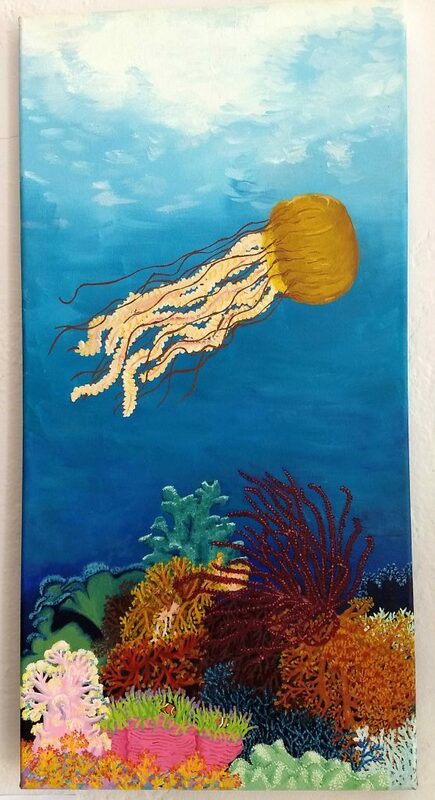 Regular Gallery hours: Wednesday through Saturday, 1:00-5:00pm. 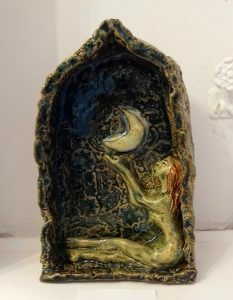 Our 26th Annual women’s only exhibit by and for local women artists. 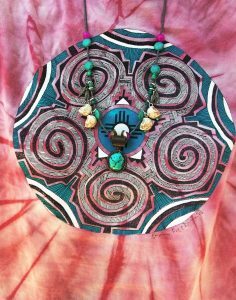 Come and join us in the celebration of our divine feminine power. All mediums and subject matter accepted. THE CASTLE VOICE IS HERE! ‘DRAWING DOWN THE MUSE’ Opening Reception this Saturday, April 7th. Our 26th Annual women’s only exhibit by and for local women artists. 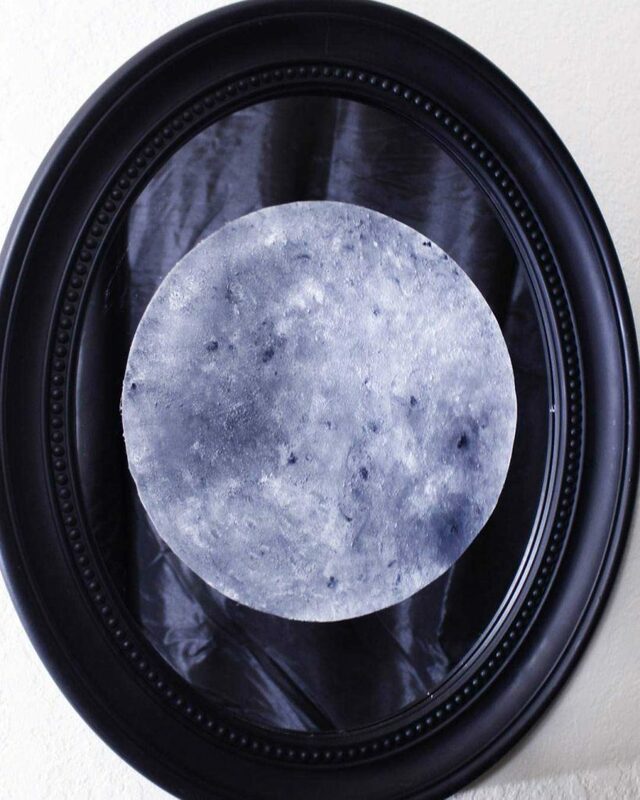 Join us in celebrating work exploring all mediums and subject matter by women artists. 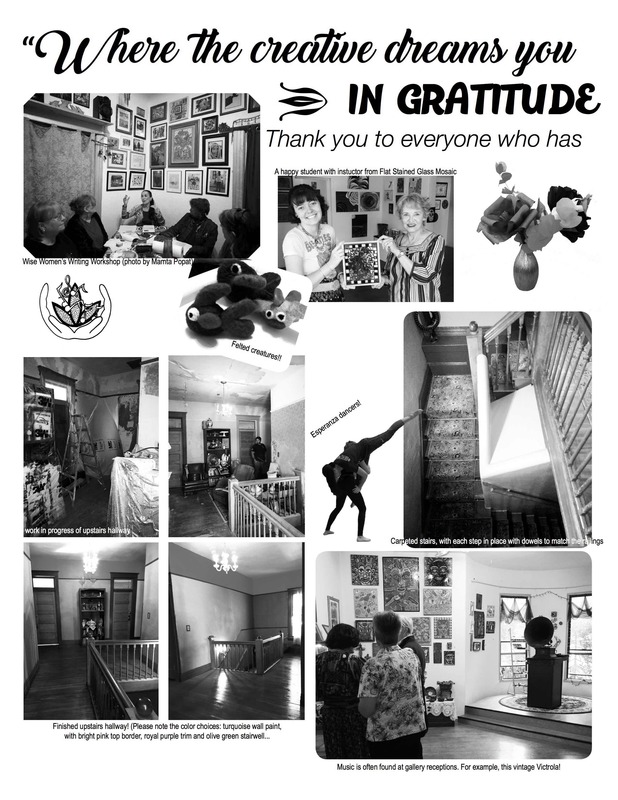 Please join WomanKraft in celebrating a brand new exhibit and long standing tradition at 388 S. Stone Avenue. 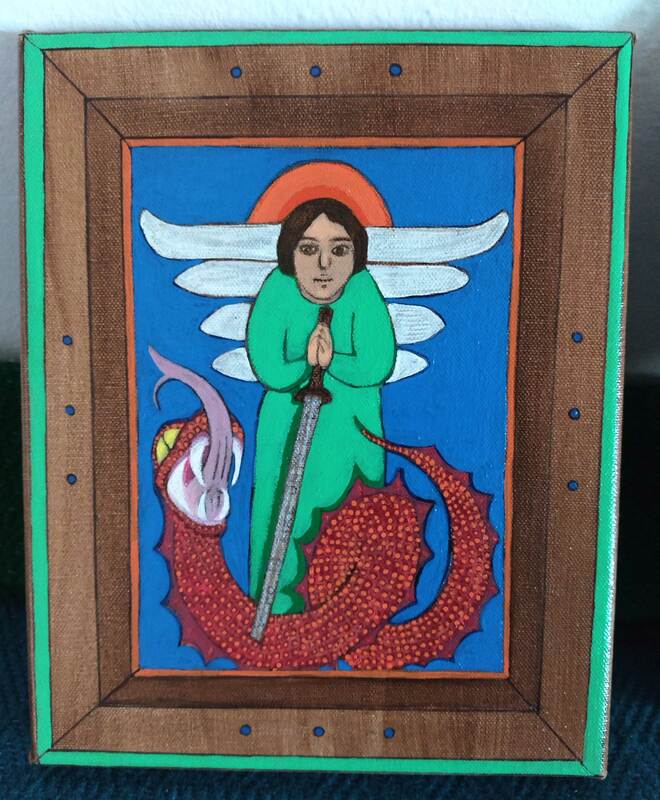 This exhibit, entitled “Drawing Down the Muse”, will feature a large variety of local artists, all of them women. Subject matter will vary greatly for your viewing pleasure. BINGO NIGHT! Friday, April 27th! $5 for non-members, $3 for members. And it only get’s better from there! Each additional card is only $1! 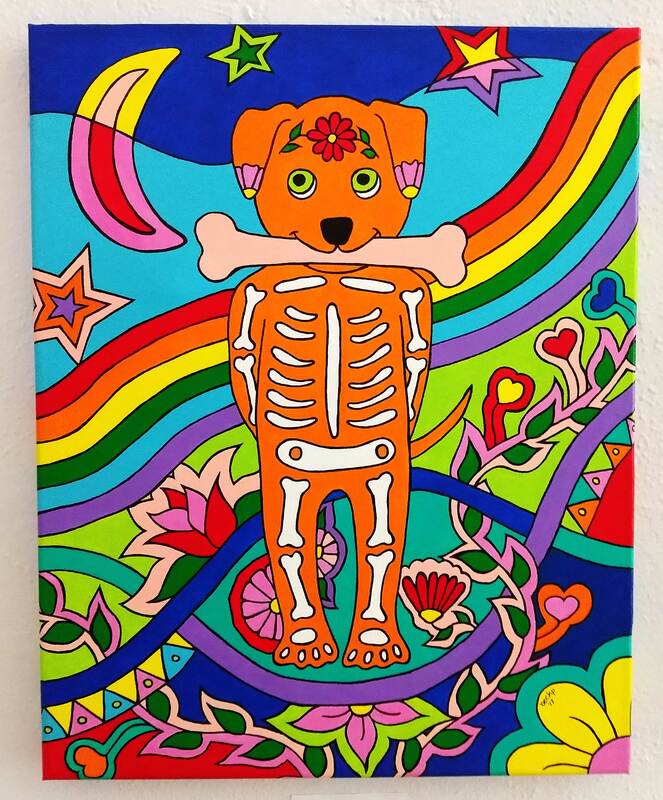 Prizes include: art, plants, gift certificates, homemade goodies, jewelry, candles, magnets… and more! Our next Bingo night will be Friday, April 27th, 7-9pm. 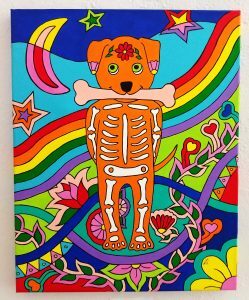 “Out of this World” Reception Night THIS Saturday!! 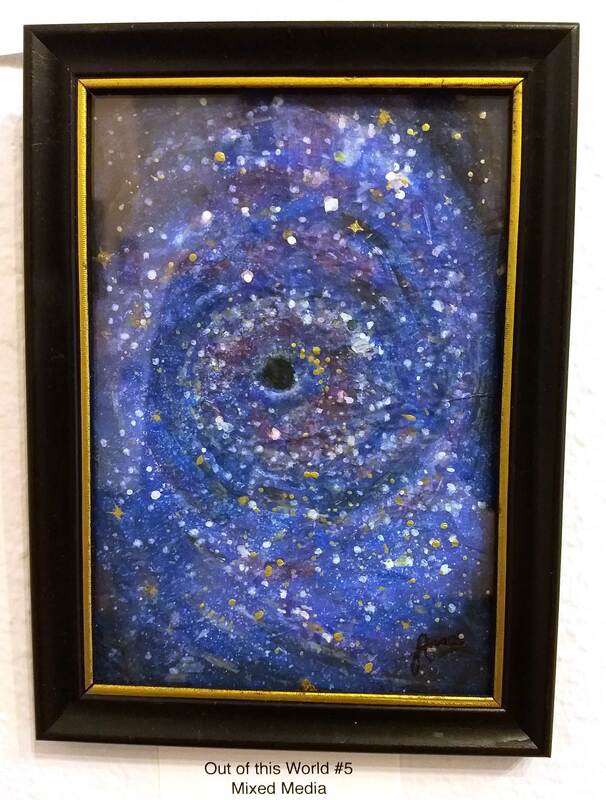 Featuring work by local artists inspired by the vastness of space..
Galaxies, nebulas, stars, planets, alien creatures, constellations, and astrology! by the Esperanza Dance Project!! Special Surprise Performance at the Reception!! 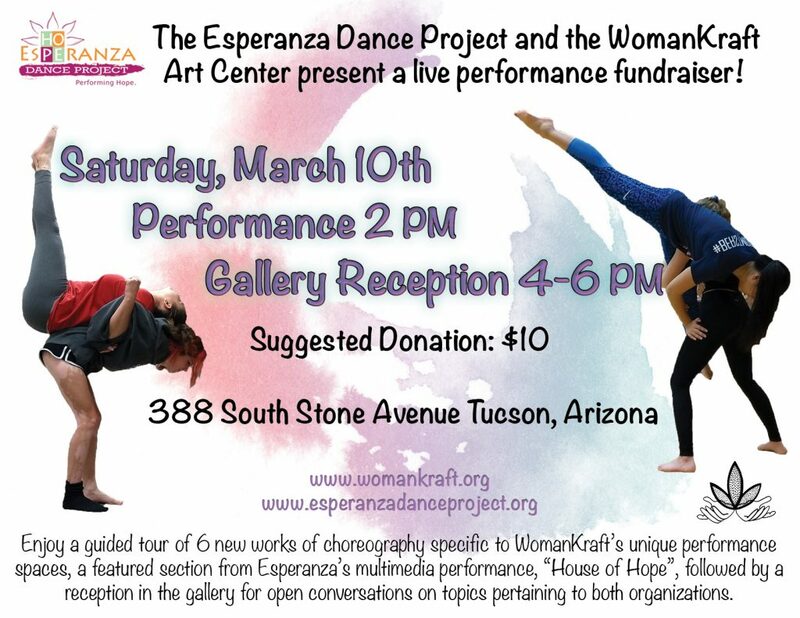 At the Reception this Saturday Night, the Esperanza Dance Project will be making a surprise appearance with a preview of choreography created for the upcoming fundraiser on March 10th. WE ARE SO EXCITED! LIVE DANCE! 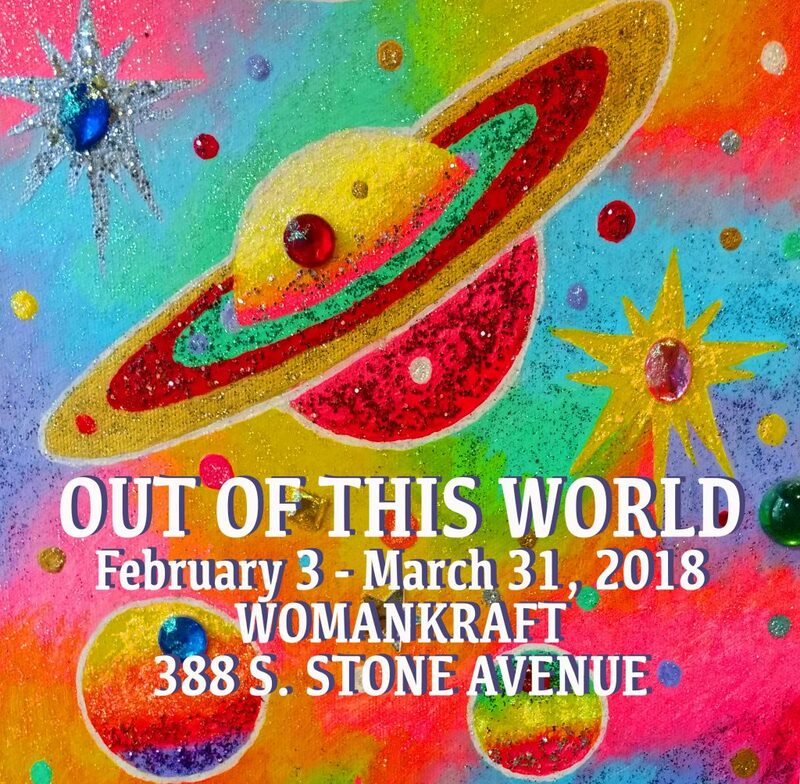 Please join WomanKraft in celebrating this exciting exhibit with an evening reception this weekend at 388 S. Stone Avenue. 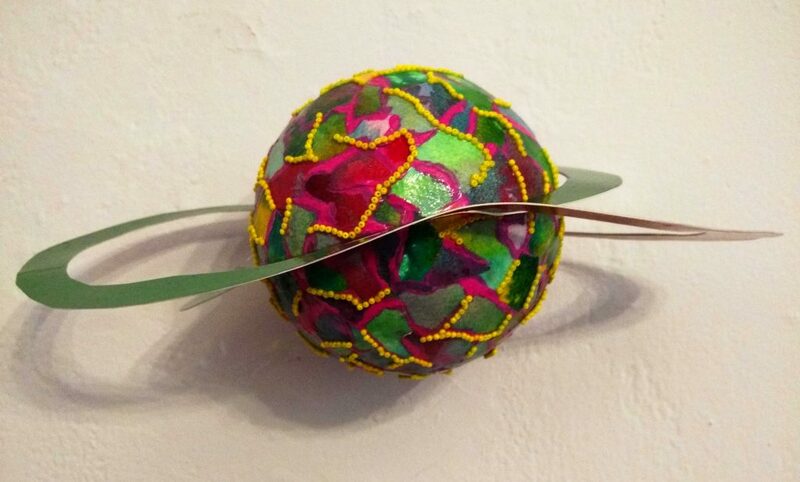 This exhibit, “Out of this World”, will feature a variety of work by local artists exploring the theme of space, outer space, magical mystical astronomical anomalies and more! All mediums. located at 388 S. Stone Avenue, Tucson. Please join us for a very special performance and reception on Saturday, March 10th, from 2 to 6pm. Esperanza company members will present and perform brand new choreography specific to WomanKraft’s unique performance spaces. Audience members will be taken on a guided tour to view 6 mini performances by the dancers, as well as a featured section from Esperanza’s multimedia performance, “House of Hope”. for an chance to open conversations on topics pertaining to both organizations. When: Saturday, March 10th. Performances 2-4 PM, Reception 4-6 PM. WomanKraft Art Center, located at 388 S. Stone Ave. Tucson, AZ 85701 currently has a CALL TO LOCAL ARTISTS! 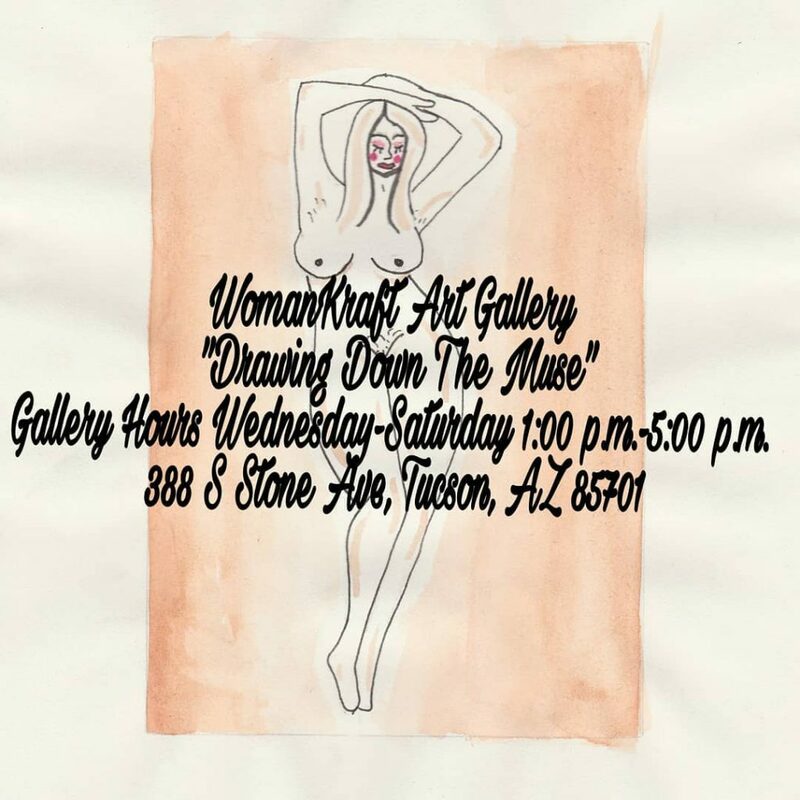 Upcoming exhibition: This is the 26th annual women’s only exhibit “Drawing Down the Muse”, by and for local women artists. 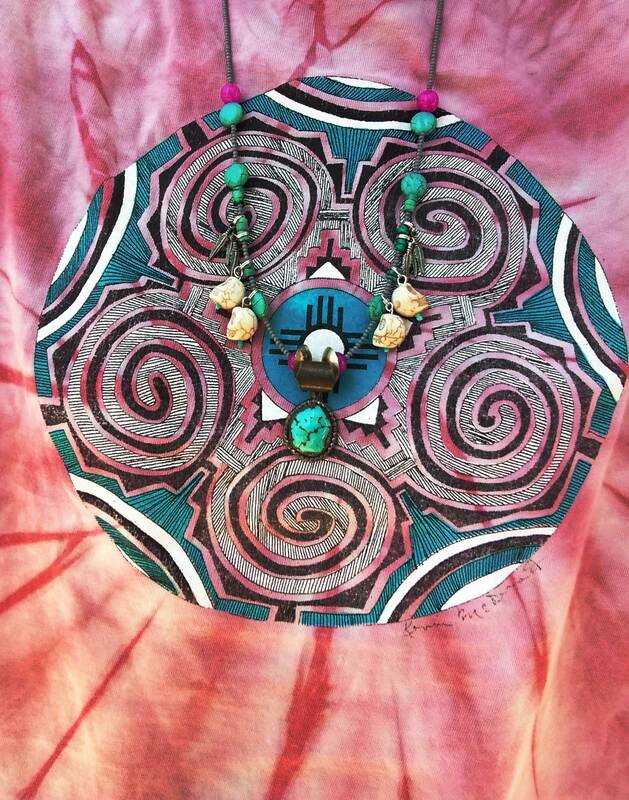 Come and join us in the celebration of our divine feminine power. All mediums and subject matter accepted. Deadline for submissions: March 24th. Interested in exhibiting? Call (520) 629-9976 Ext. 3 for appointments with Director of Exhibits Zoe Rhyne. 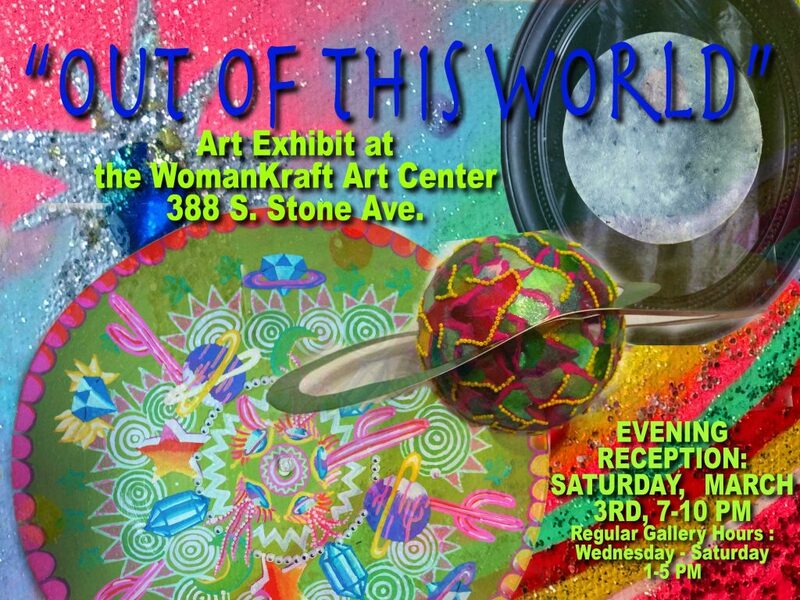 New Exhibit “Out of this World” opens this Saturday @ WomanKraft! 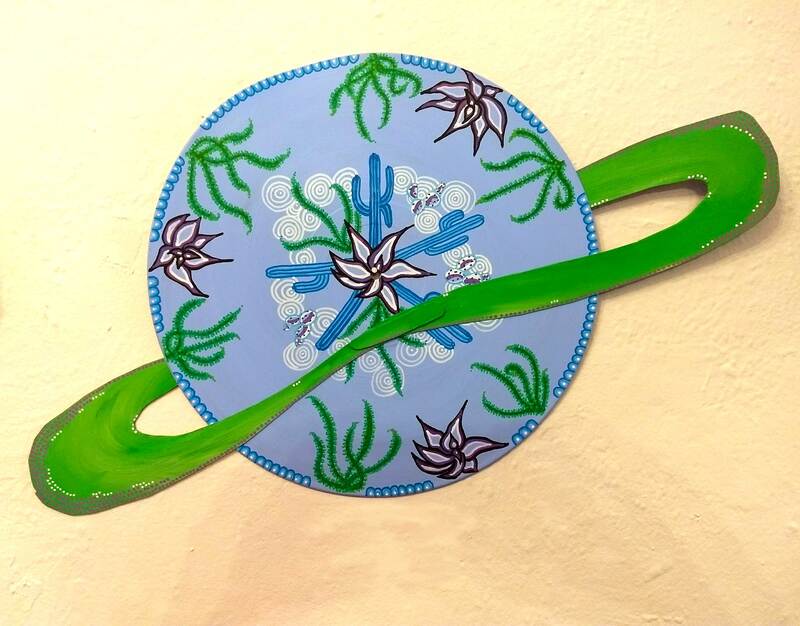 This new exhibit features work inspired by the vastness of space..
Galaxies, nebulas, stars, planets, alien creatures or worlds, constellations, and astrology! 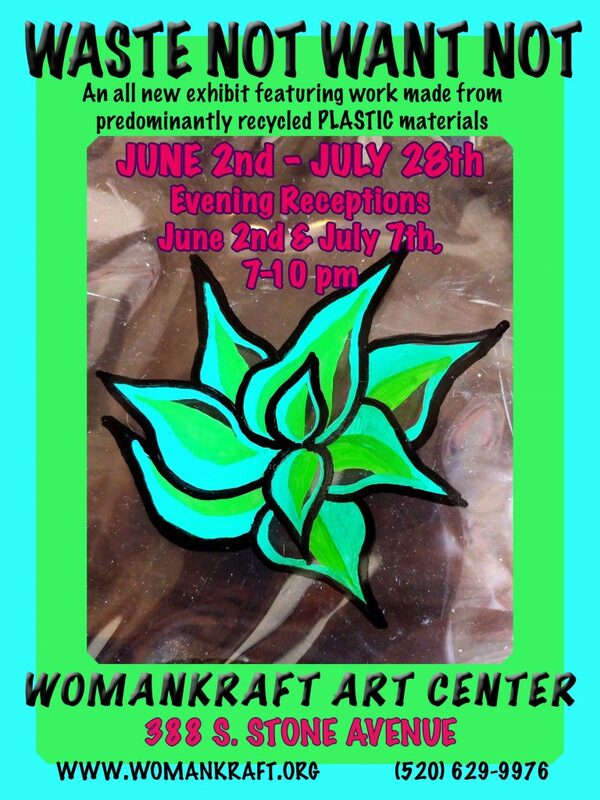 Please join WomanKraft in celebrating a brand new exhibit opening this weekend at 388 S. Stone Avenue. 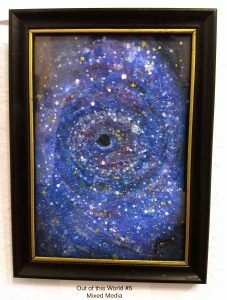 This exhibit, entitled “Out of this World”, will feature a variety of work by local artists exploring the theme of space, outer space, magical mystical astronomical anomalies and more! All mediums. The Rummage Sale is HERE!! 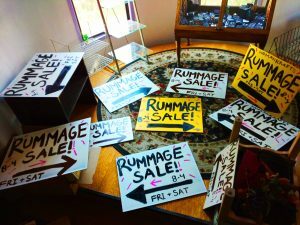 The Rummage Sale, WomanKraft’s largest indoor two day fundraiser, is happening this very weekend in Tucson! 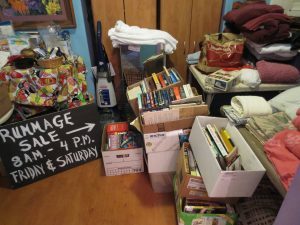 The Rummage Sale is HERE! both days from 8:00 AM to 4:00 PM! The sale will be held inside, spreading throughout our entire gallery space. See above for some preparation shots from our hard working volunteers! WHEN: Friday, January 19 and Saturday January 20th, both days 8 A.M.– 4 P.M.
WHAT: All kinds of great things! We promise you’ll find something you just can’t live without! 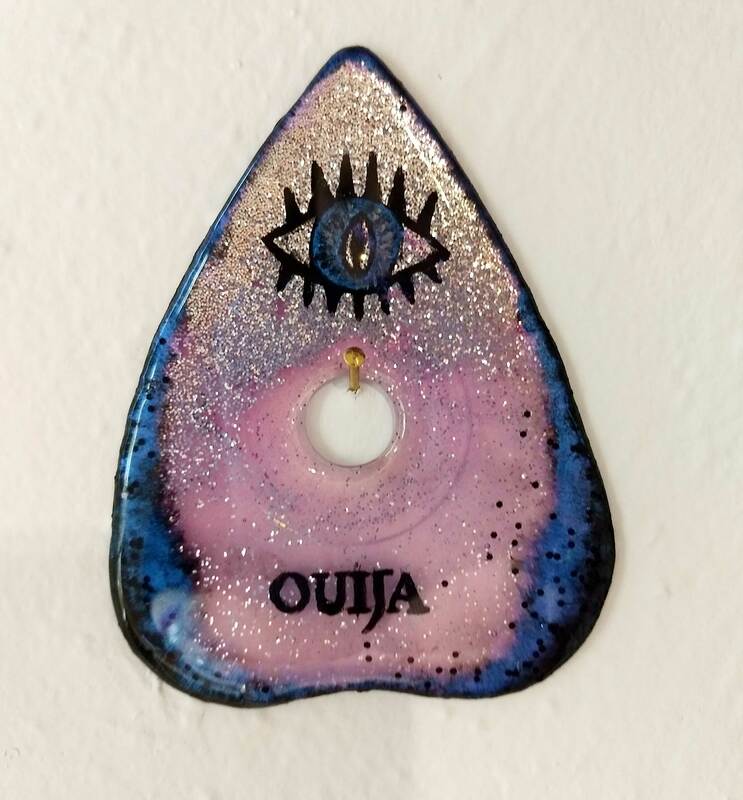 From toys, decorations, art books, novels, kitchen utensils, a huge variety of art supplies, technology and clothing.. there is something for everyone. The sale will be held indoors, inside the gallery space for your shopping comfort!! Come more than once! And tell your friends!! Receptions: February 3 + March 3, 2018. Our glorious planet is ever inspiring in her diversity, let’s look even further past our Earth, and into the vastness of space! 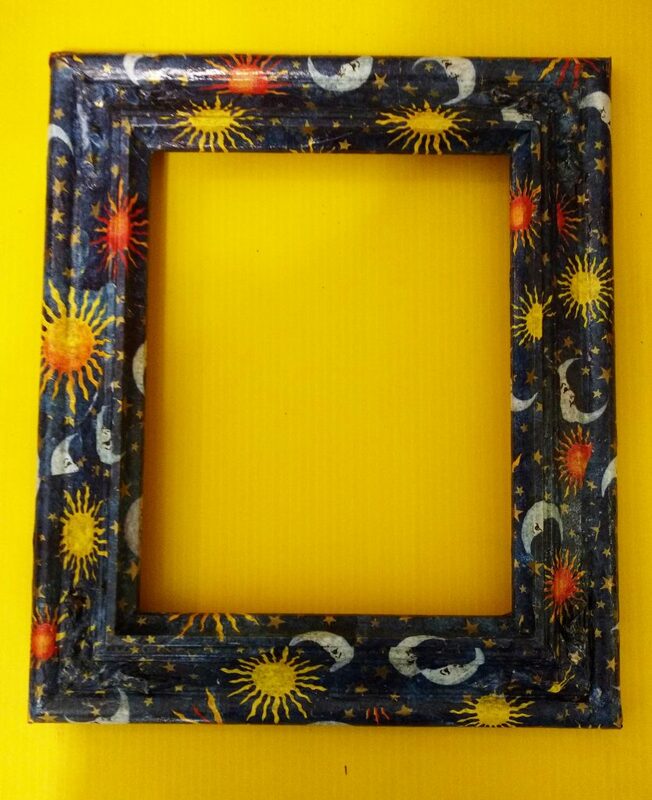 Galaxies, nebulas, stars, planets, alien creatures or worlds, constellations, astrology! The possibilities are only limited by your imagination. All mediums accepted. Deadline for submissions: January 20, 2018. The Castle Voice is here!! 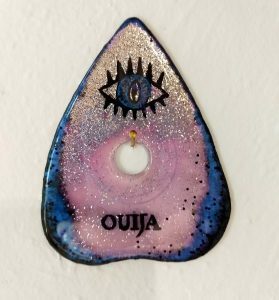 New CALL TO ARTISTS, and Rummage Sale UPDATE! The newest edition of THE CASTLE VOICE IS HERE!! 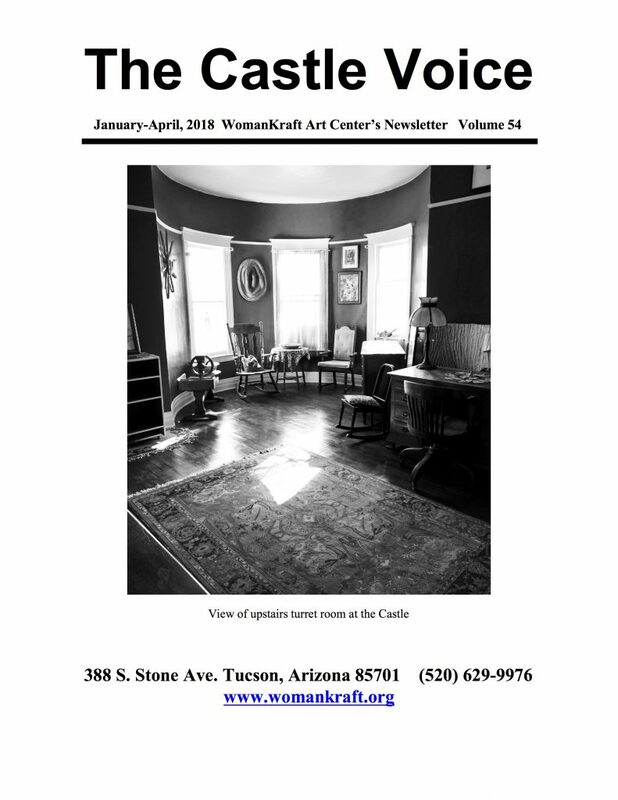 Good for the months of January through April, 2018, the Castle Voice contains all of the pertinent details of events, classes and workshops and other exciting news from the WomanKraft Art Center. Click on the cover below to download your very own copy!! 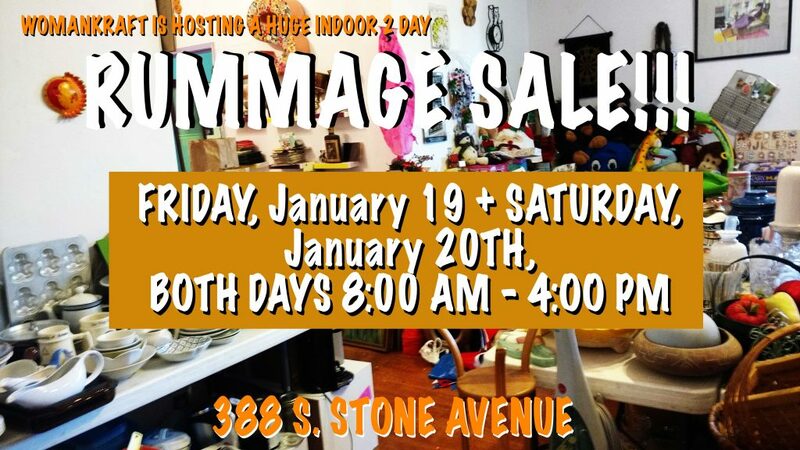 Also, the INDOOR RUMMAGE SALE is almost here!! 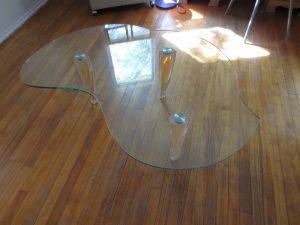 WomanKraft Art Center is hosting a huge indoor RUMMAGE SALE!! 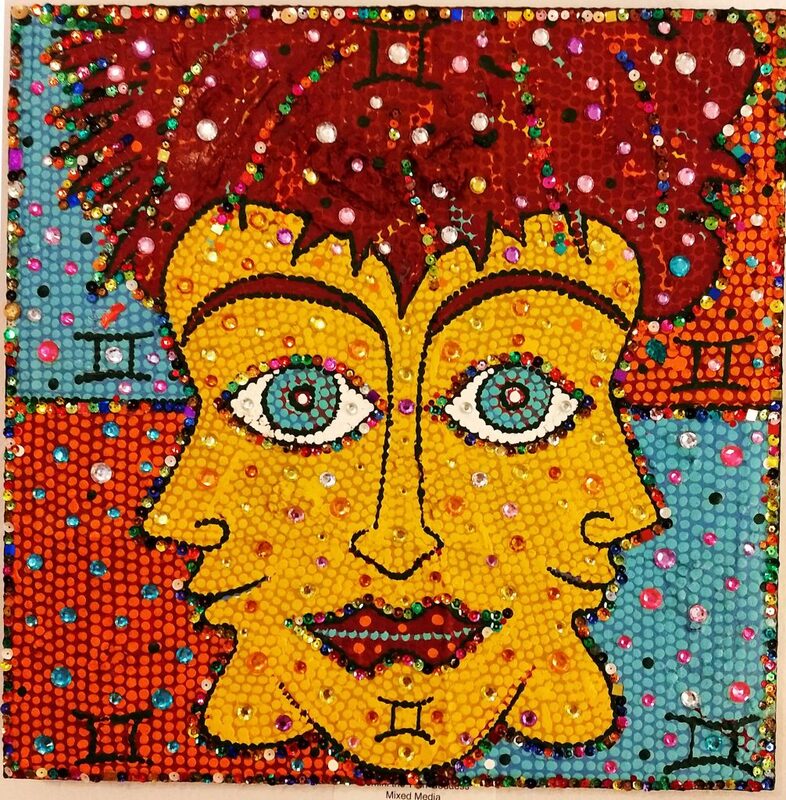 WomanKraft, a 501 (c)3 non-profit arts organization hosts it’s bi-annual largest fundraiser. 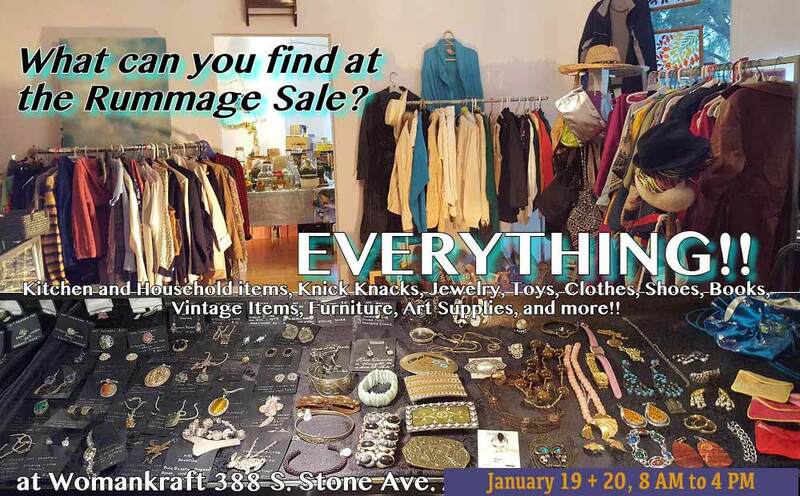 WHAT: SUPPORT a local 501(c)3 non-profit organization at WomanKraft’s LARGEST bi-annual fundraiser, THE INDOOR RUMMAGE SALE!! We promise you’ll find something you just can’t live without! From toys, decorations, collection of art books, novels, and kitchen utensils, a huge variety of art supplies, technology and clothing.. there is something for everyone. The sale will be held inside the warm gallery for your shopping comfort!! Come more than once! And tell your friends! 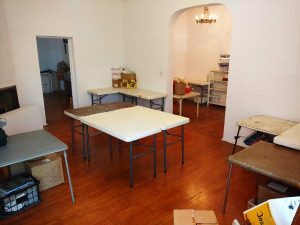 From toys, decorations, collection of art books, novels, and kitchen utensils, a huge variety of art supplies, tools, records, a keyboard, fancy furniture, not so fancy lamps, everything that is missing from you dream kitchen, technology goodies and clothing.. there is something for everyone. Come more than once! And please tell your friends! THE SALE RUNS Friday and Saturday, January 19 + 20th, 8am – 4pm both days. Please call (520)629-9976 ext. 1 for details and to schedule participation. Volunteers needed! Are you an artist interested in exhibiting with WomanKraft? Call 629-9976 ext. 3 for appointments with Director of Exhibits, Zoe Rhyne or to speak to her in person call Thursday or Friday 1-5pm. Artists please note: Shows are filled from first to respond. Deadlines indicated the last day works will be viewed, not the first. Hence, make contact A.S.A.P.